This is a Symbolics Model PE36-PCONS, Part No 365404 Rev C console. My serial number is 21811. ("There are many like it, but this one is mine.") An album of detailed internal photographs is available including full size versions of all the below images. 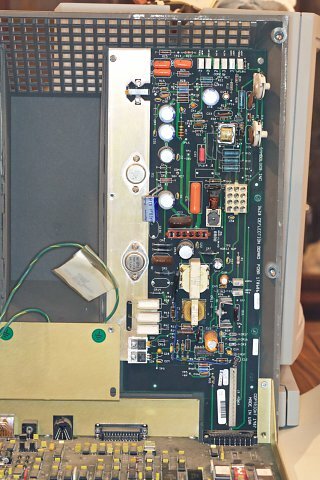 The console seems to be in good shape, with all electrolytic capacitors intact (not bulging or leaking). I should probably test the power supply outputs as there are trimmers for the voltages to adjust them. Functionally it seems to work properly. The picture is not great (I don't know how to use the adjustments to improve it) but it's adequate. The console cable/connector at the back is a bit temperamental; if it's not held on just correctly the monitor makes an unhappy noise and the display doesn't show properly. To open the console, you simply remove four flat-head screws from the back and slide it out. This reveals an L-shaped chassis. Additionally, there is a power distribution cable of 15 pins that goes from the power supply to the other two PCBs. Only 12 of those pins are connected on the power supply, though. Finally, the Console Controller and the Deflection Board meet in the corner with a connector labeled AMP 532548-3 9110. The controller card on the back of the CRT is difficult to remove, so I didn't get great pictures of it and then only with a cell phone camera. Finally, there is a box into which the CRT flyback voltage goes, and with other leads to the Video Amp board and the Deflection Controller. 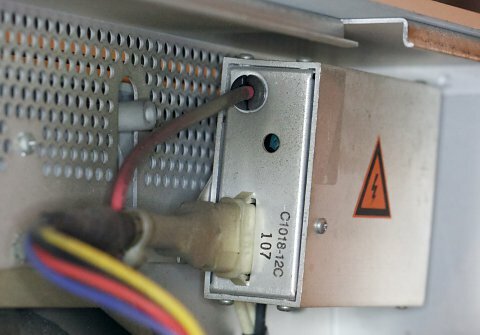 On the power supply, there is a large metal cover that can be removed with two screws and two nuts to reveal the transformer plus five pairs of a capacitor and inductor. 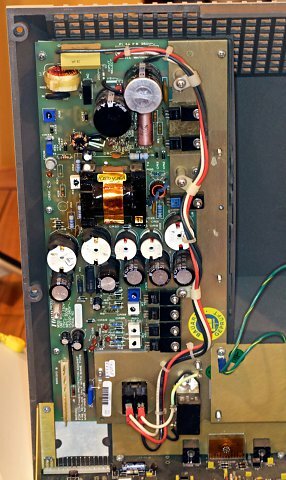 The power supply has 12 electrolytic capacitors. One of these (C7, a pink axial capacitor) I'm not actually sure exactly what it is. All seem to be in good condition with no obvious bowing of the tops or leaks. 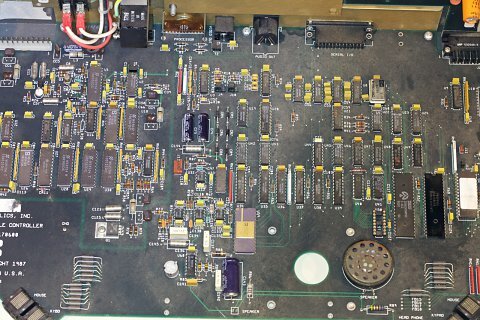 There is a large heat sink on one end of the board with seven transistors bolted to it. There are also two large and two small power transistors mounted on a huge heat sink. There are 12 electrolytic capacitors. On mine, they all appear intact. Two have an odd label that reads 33 uF 200V but with spaces between the two 3's. They are the same size as other 470 uF, 63V caps, so maybe they are just 33 uF. The Symbolics keyboard and mouse both connect to this board on either side, and there is a headphone connector on the right side as well. I wonder if two mice or keyboards could be attached simultaneously. There is a speaker on this board. It can be made louder and quieter with LOCAL-L and LOCAL-Q. There are 8 DIP switches with no label as to what their purpose is. From switch 1-8 mine are 01110001. There is one thing that looks like a trimmer, R26. There is an unpopulated 2x8 DIP socket, U50, and two unpopulated 2x10 positions labeled U10/SP1 and U11/SP2. There is one electrolytic capacitor on it, a navy blue one with values 85ºC 47uF 160V that was extremely hard to read with a little mirror. It seems to be intact. This board has thick wire connections to the little voltage box and the deflection board, and one small 4-pin connection to the console controller board. I couldn't see much about the CRT itself. It has two labels on the back that I could see with nothing comprehensible. One says "897PAN", and the other says "1". The CRT is housed in a case that allows it to swivel vertically when a release is pushed on the right side of the case (looking at the front of the CRT). The outer box of the console is mounted on a swivel that has about 180 degrees of travel. I couldn't see anything written on this box except for a large electrical warning sign. 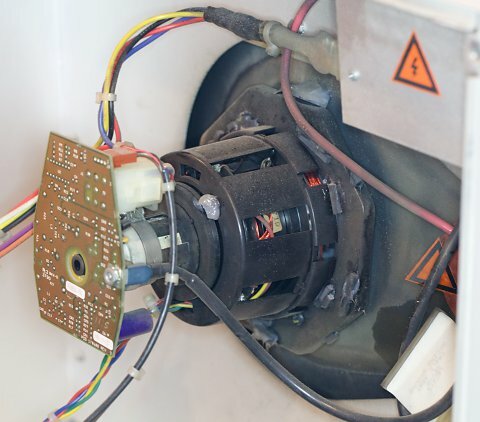 I am guessing it's a flyback transformer. There are at least five missing screws or nuts in my console interior. One of the chassis ground terminals was not connected to anything; perhaps it was supposed to be connected to the screw without a nut on it. Deflection Board: Terminal of R31 has something on it, maybe the nearby C4X has leaked? Bottom of the right (?) keyboard jack on the Console Controller card, those six pins look to still have resin on them. Perhaps the jack was repaired but the flux was not washed off. You have to be careful not to twist the connector on the cable in the opposite direction of the cable. This can cause a short in the connector and exhibit the behavior you described. I always twist the cable, not the connector when I am attaching the cable to the console or the computer.